Bireun Regency Legislative Council (DPRD) of Aceh conducted work visit (kunker) to Central Jakarta Mayor office. This visit was done to learn about governance and public service in Central Jakarta.
" 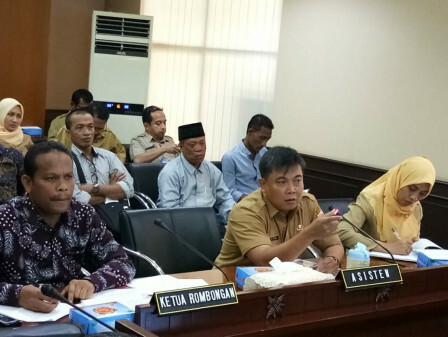 We want to study more deeply about governance issues and talented athletes management"
"We want to study more deeply about governance issues and talented athletes management from Central Jakarta government," stated Athahillah M. Saleh, Deputy Head of Bireun DPRD, Tuesday (8/28). Besides, his side also wants to study about public service and permission that have been done by Jakarta Provincial Government. Such as permit and public service that can be done quickly without waiting too long. Related to this work visit, Central Jakarta Assistant in Citizen Welfare, M. Fahmi explained, his side was grateful to have a chance to share information to develop each regions. "We will share any information needed, including our experience related to authority and work achievement," he mentioned.